CUERNAVACA, Mexico (CNS) — After Bishop Ramon Castro Castro of Cuernavaca convened a march for peace in this capital of a state beset by violence, officials responded on social media. 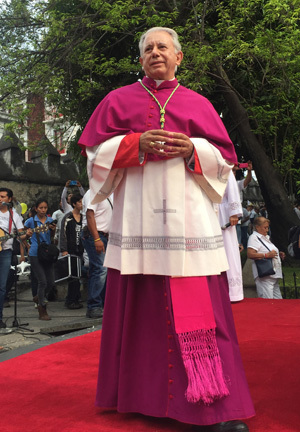 “It pains us that some (politicians) are consuming public resources in self-promotion to exaggerate their scant few achievements,” Bishop Castro told marchers at the Cuernavaca cathedral May 21. 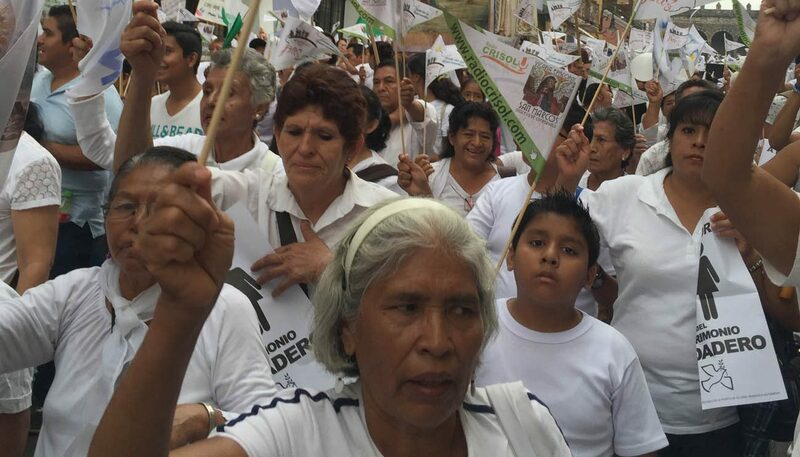 The event, the third since Bishop Castro arrived in Cuernavaca in 2013, attracted an estimated 20,000 marchers from parish communities, along with business leaders, opposition and civil society. The bishop’s focus on peace and attending to victims of violence comes as the Catholic officials speak out on issues of insecurity. Pope Francis, during a trip to Mexico in February, urged the country’s bishops to be more forceful about the drug war, which has left more than 100,000 Mexicans dead and more than 20,000 missing. Bishop Castro’s outspokenness has come at a cost: Prosecutors opened an investigation into allegations that the bishop stole $27,000 and religious artworks. In one instance in Morelos, thugs raided and seized the parish in the town of Tepalcingo, robbed funds for the town’s annual feast day, threatened to lynch the priest and “stepped on and profaned” hosts, Bishop Castro said. The authorities “did not lift a finger” to stop the raid and have not opened a criminal investigation, he said. Locals working with victims of violence in Morelos say it is a common pattern under Gov. Graco Ramirez, who assumed office at roughly the same time Bishop Castro arrived in Cuernavaca. “If any person disagrees with the governor, there’s a campaign against them,” said Roberto Villanueva Guzman, director of a program for providing attention to victims of violence at the Autonomous University of Morelos State. Morelos state sits to the south of Mexico City and occupies an alleyway for smuggling drugs from Acapulco and Guerrero state to the national capital and beyond. Catholic poet Javier Sicilia founded the victims’ advocacy organization “Movement for Peace with Justice and Dignity” in 2011 after his son was kidnapped and murdered in Morelos. The state has been disputed by drug cartels trying to control the territory. The mayor of the Cuernavaca suburb Temixco was murdered in her home the day after taking office in January. On May 23, work began on exhuming an illegal grave in which more than 100 bodies are buried, including a merchant named Oliver Wenceslao Navarrete, who was kidnapped and whose body had been in a state morgue at one point, according to Sicilia’s group. Families of the victims at the march told similar stories of difficulties with the government.